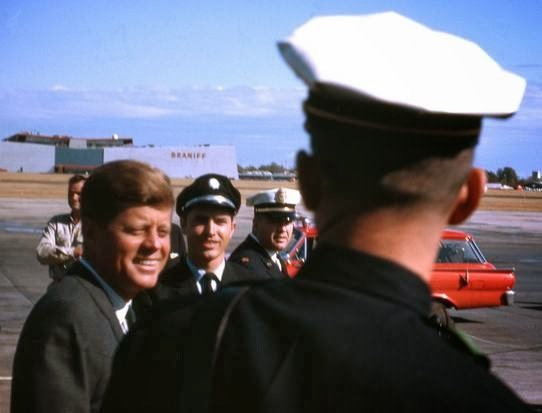 On Nov. 22, 1963, many Dallas residents skipped work or school to see President John F. Kennedy arrive at Love Field. Others watched the motorcade downtown or attended the luncheon where JFK was to speak. In an instant, everyone was united by a tragic moment. The president was shot at Dealey Plaza amid throngs of waving supporters. Dallas — and the nation and the world — was shaken with grief. As part of this paper’s yearlong series on JFK, The Dallas Morning News has collected North Texans’ memories of that fateful day. Joan Nall, then a senior at Garland High School, was among the first to arrive at Love Field. She found a spot with a great view of the presidential limo. She considered whether she would shake his hand or snap a photo with the 35mm camera she borrowed from her mother. She knew she wouldn’t have the chance to do both. “I thought, well, if I take the picture, I’ll have that forever,” she said. Fifty years later, she still has the photos, including one of Kennedy greeting people on the tarmac. Nall loved Kennedy for his politics as much as his youth and poise. “It was like a fairy tale, but I also respected everything he did,” she said. The day plays out like a movie in her head. After watching the presidential limo drive into the distance, she left with her friends. Exiting the parking lot, they were stuck in traffic and had the radio on. That’s when they heard it: The president had been shot. They thought it was a cruel joke. They had just seen him, full of life. They pulled into a gas station and asked the attendant if the news was true. With confirmation, the day’s excitement was wiped away. Nall cried the entire weekend. “It was an awakening, or a slap — this is real life kind of thing,” she said. Now, she treasures her photos, documentation of her beloved president’s final hours. David and Jean Kerr arrived early at the Dallas Trade Mart for the luncheon where the president would speak. Jean was scheduled to sing the national anthem, and she had practiced all morning to make sure it was perfect. Her nervous excitement fit the tremendous honor. The president was running late, so an official told the crowd to begin eating. David was only a few bites in when a reporter jumped from his seat and yelled, “Oh, my God, the president’s been shot!” The crowd was in shock, and some of the waiters began crying. The Kerrs never finished their lunch, and Jean never sang. “It was like being asked to sing to the world, and all of the sudden, the world didn’t show up,” Jean said. She drove home and David drove back to his office. He told the switchboard operator to send everyone home for the day. This wasn’t a time for work. That Sunday, the Kerrs attended service at First Presbyterian Church of Dallas, near City Hall. As the minister delivered his sermon, an usher approached the altar and delivered him a note. The minister told his congregation that they must vacate the church through the parking lot. Sirens blared outside. The Kerrs knew the evacuation must somehow be connected to the assassination. They had no idea what had happened until they turned on the TV and found that Oswald had been shot. It was another twist in a disorienting week, another shot of grief. On the morning of Kennedy’s visit, Dr. Herbie K. Johnson, a teacher at Roosevelt High School, had a bad feeling. He had witnessed racism in Dallas throughout his life and felt Kennedy held hope for equality. At the same time, he knew that many people in Dallas vehemently disliked JFK. He listened to a pocket radio while waiting for students to return from the motorcade route. That’s when his fears were realized. The president had been shot. Students, distraught and tearful, filed off a bus and back to school. “Naturally, they wanted to know why — why,” Johnson said. The president’s shooting became an intense teaching moment for Johnson, who taught American history and government and a course called “Problems in Democracy.” His students were aware of current affairs; they knew what the president meant to their community. He didn’t have clear-cut answers about why JFK was killed. But he did his best to provide an informed “we don’t know,” touching on the missile crisis in Cuba, domestic political pressures and Kennedy’s focus on civil rights. It felt like a huge blow to the black community. “Kennedy meant that we would have equal protection under the law … We wanted to work for what we got, but we wanted an equal chance,” Johnson said. W.K. Jeffus was a 16-year-old student at Sunset High School and wore khakis and a red and white striped shirt with a high collar to high school that day. He was on flag detail for the ROTC. In the morning, he raised the flag. When it rained, he lowered it. And when the sun came out, he raised it again. The day was a fine display of Dallas weather. Jeffus sat in geometry class, like any other day, when his teacher left the room without explanation. Another teacher walked down the hallways crying. Finally, the principal came on the public address system and explained that the president had been shot. Jeffus knew what had to be done. He walked outside and lowered the flag to half-staff. In Jeffus’ next period, history, the teacher asked the class to flip to the back of the book where it listed the dates of presidents’ service. Writing in textbooks was a “grave sin,” but the teacher instructed them to write, “Nov. 22, 1963, Dallas, TX, 1 p.m.” next to the hyphen that indicated Kennedy’s ongoing term. Joe Patterson, now pastor of Greater New Zion Baptist Church, was working in the warehouse of a wholesale florist on Ross Avenue when Kennedy visited Dallas. During his daily morning prayers, he asked that the rain clouds would clear for a beautiful day. His prayer was answered as the clouds dispersed. Hours later, as Patterson went about the day’s business, the company’s owner walked in and told his staff that the president had been shot. Work stopped immediately; no one knew what to do. Patterson felt devastated and again began to pray. Sometime later, Patterson found out that if it had continued raining throughout the early afternoon, a bubble would have topped the president’s limo. But he had prayed for a clear day, weather for an unprotected convertible. “For a long time, I felt guilty, as if I could have prevented it had I prayed another prayer,” Patterson said. Freelance writer Leslie Minora can be reached at leslie.minora@gmail.com.